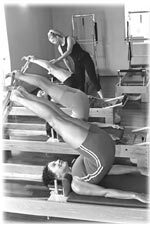 To teach the Classical Pilates method you have to practice Classical Pilates. When choosing a Classical Pilates training provider, whether you are already a Fitness Instructor or have never taught before, high quality and affordable Pilates training is key to a successful and fulfilling career as a Pilates Teacher. New Pilates teachers require knowledge, skill and confidence to provide effective personal Pilates training and group Pilates classes. A solid Pilates teacher training will provide a foundation in understanding the Pilates Method, the underlying principles, essential equipment and how it all works together ("The Integrated System'). This creates a profound difference in the new teacher's ability to provide quality instruction. Joseph Pilates spent his lifetime creating and modifying over 500 individual exercises for his Pilates system “contrology”. We always say that these courses are mentally and physically challenging and require many hours of practice and commitment. This is Pilates teacher training for the committed individual. All of our Pilates Teacher training programmes are built on a strong foundation. Every Classical Pilates student teacher, regardless of his/her fitness level or movement experience starts by learning the Basic System. These are the essential exercises that collectively form the core of what Joseph Pilates called "the heart and soul" exercises, also known as the Basic System. Mastering these essential Pilates exercises will create a foundation on which to progress to the next level. Inexpensive flights from England, Ireland and the rest of Europe to Glasgow Prestwick International Airport.